You'll be £12.99 closer to your next £10.00 credit when you purchase Boesinghe. What's this? In the aftermath of the War the war-ravaged countryside was restored and the trenches of the Western Front were filled in. 75 years after the War a group of Belgians, known as the Diggers, excavated a classic trench system at Boesinghe, discovering many artefacts as well as remains of the Fallen. One section has been preserved. Boesinghe is a canal village and the opposing sides continually bombarded each other across the wide Yser canal. In the opening phases of the Second battle of Ypres, the Germans used gas here., Despite this the British flank held. Late in the summer of 1917 the Allies launched the Third battle of Ypres and the Guards Division spearheaded the crossing of the canal. They attained their planned objectives but at great cost. The many military cemeteries in the area are poignant reminders of the cost of war even in what some regarded as a 'quiet' sector. Stephen McGreal is a Wirral man who has worked in the ship yards and as a merchant seaman. He now runs his own business making and restoring rocking horses. He has three published works: The Cheshire Bantams, The Zeebrugge and Ostend Raids 1918, and War on the Hospital Ships, all with Pen and Sword. 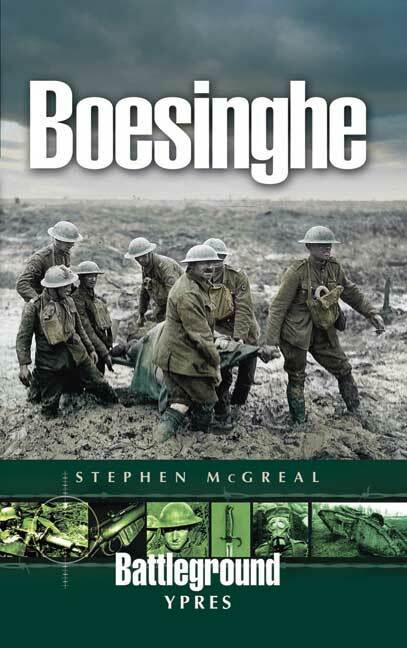 Stephen McGreal has done a fine job of compilation of the stories, maps and images that make the 'Battleground Europe' series what they are, and 'Boesinghe' would be a fine buy for anyone wishing to understand more about and visit this part of the Western Front. Reckon that you know Ypres? Have you been to Boesinghe? In all my visits to the crucible that was Ypres I have not. But armed with this book I intend to. As Battleground Europe series Editor, Nigel Cave notes Boesinghe is 'not a name that often comes up in battlefield touring', adding that this northern tip suffers a "paucity of visitors'. For the ignorant of this area of the salient, this new work seems encyclopaedic in its coverage of the area from the early days of the war, through 1915 and on to the capture of Pilckem ridge. Many of the illustrations are new to me - even if a few suffer from lack of contrast - the maps well chosen, the text clear, sharp, concise and gripping, and the six mapped tours well worthwhile ventures. This book is, I think, a small essential reference, both to those who want to visit a 'new' area of the salient and those who just want to put it on the shelves for reference. Excellent.